Yes, there are injustices and imbalances of power and wealth that we collectively need to remedy. But the way to do that is to embrace fact, responsibility, choice, consequence and thrift rather than deny those realities in favor of a false dichotomy of victim and non-victim. Next, the cost of the meal. 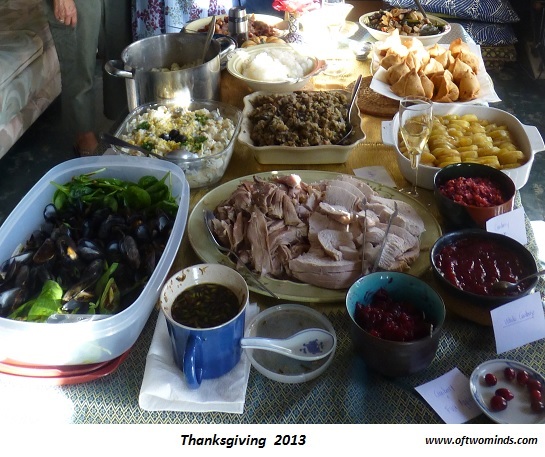 Since everything was home-made in basic kitchens (tiny, in our case), the cost was ingredients. The labor was provided by mutliple hands--the essence of community, friendship and family. --potatoes: huge bag from the dollar store. --macaroni in potato salad: cheap, either on sale or at dollar stores. --a few apples: cheap, found in the remainder-bruised bin of the supermarket, 75 cents. --2 lbs. fresh cranberries: less than $4. --ingredients for handmade somosas: potatoes (cheap), peas (cheap), flour (cheap). --day-old bread for stuffing: cheap. --ingredients for nimono: a few pieces of chicken (cheap), Asian potatoes (cheap), a few pieces of seaweed (cheap). --natural gas to cook/bake the meal: cheap, a couple bucks if that. Are the "poor" really too poor to buy fresh ingredients that add up to $3 per serving? Let's start with the fact that according to the U.S. Census Bureau, 49% of Americans Get Gov’t Benefits; 82 million in Households on Medicaid. That means roughly 156 million Americans out of 317 million total population are receiving cash benefits (i.e. direct transfers) from the Federal government. Approximately 57 million receive Social Security retirement or disability benefits. The excusers, enablers and guilt-trippers seek to divide the populace into two (and only two) classes: victims and non-victims, who are by definition heartless hypocrites (or worse). 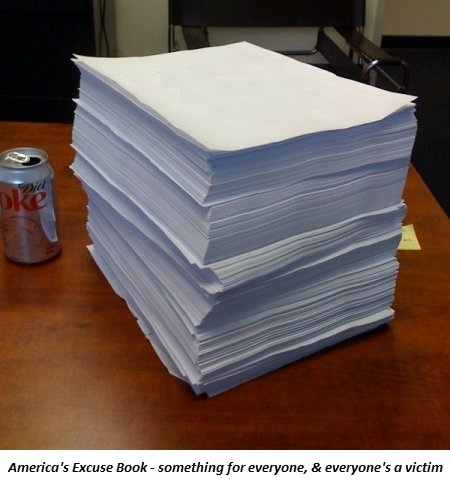 Luckily for the excusers, enablers and guilt-trippers, America's Excuse Book runs into the thousands of pages. There are excuses for literally everyone and every situation; almost everyone can stake a claim to victimhood. People have written me that the "poor" don't have stoves/ovens, and this is why they are forced to eat junk food. Really? What percentage of people in America live in dwellings without stoves/ovens? People in residential single-occupancy (RSOs) flophouses, perhaps, but precisely how many people of the 317 million Americans have zero access to a single burner? I suspect the number is quite small. As I have noted before, 2 billion people in China and India prepare meals with one burner and a wok. If I didn't have an oven, I can prepare a nice meal with a single-burner camp stove and a small wok. So can several billion other people. Let's distinguish between Fate and consequences of choices. A person who discovers they have a brain tumor had no choice in the matter--the cancer was a matter of fate. A person who is obese due to poor dietary and fitness choices and presents their sleep apnea, diabetes, high blood pressure, etc. etc. as fate is avoiding the causal connection between their lifestyle and life choices and their health problems. If a person with low income chooses to stop buying fast food, junk food, sodas, snacks, chips and convenience food and only buys and prepare real food low on the food chain, they will instantly become wealthier because real food that is prepared and not thrown out is significantly cheaper than fast food, junk food, snacks, etc. If the low-income person also stops smoking, they will also instantly become wealthier. Since wealth creation is increasingly based on human and social capital and learning on one's own, the low-income person who stops watching TV and spending hours on social media will instantly be "wealthy" in terms of time that can be invested in building human and social capital--subjects I have written about extensively here, precisely because they require essentially no money other than an Internet connection. Building human and social capital is mostly a matter of effort and time. Anyone can improve their human and social capital and thus eventually their income and financial security. Surveys routinely find that typical Americans spend 4-6 hours a day watching TV or other entertainment. The individual who chooses to take those 28-42 hours a week and invest them in mastering a new skill, seeking mentors, becoming a mentor--all the building blocks of human and social capital--will soon find that there are multiple returns on their investment of time and effort. This is why troubled families will often subconsciously select one child as the "cause" of the family's difficulties. If everyone blames this one child, they are magically free of responsibility. Did the person who claims to be denied access to a $3/serving meal really do everything in their power to forego counterproductive or wasteful spending so they could spend their food stamps or cash on real food? Did they devote their spare time to building human and social capital, for example, learning how to cook, sharing meals with others, teaching others how to cook once they had learned, etc.? Everyone who feels enraged by the previous paragraph has to ask themselves: what is the real root of your outrage and your need to make excuses for everyone with difficulties resulting from choices made in response to their circumstances? The question is always: is there absolutely nothing that a person can do to improve their circumstances? Are there things that could be learned for free that would improve their life? Is there absolutely nothing they can do on their own behalf in terms of building human and scial capital, both of which require only effort and time? Are there absolutely no alternatives or choices, even in the smallest details of everyday life? In 14 of the past 20 years, my net taxable wages were less than $10,000 a year. In other words, by official measures, I have been "poor" for much of my working life. Changing one's circumstances for the better generally requires not months of unceasing discipline, work and effort, but years or even decades of unceasing, dedicated toil, and daily sacrifices of present-day convenience for future benefits. Another big chunk of my life was spent working for low-paying non-profit groups advancing causes I believe in. The low pay was a consequence that went with the choice of advancing causes one is devoted to furthering. When I was a builder in my youth, I gave jobs to vets and guys with criminal records-- marijuana dealing convictions, petty theft, that kind of thing. This choice opened the door to various risks and potential non-financial rewards. The reality is that "there is no security on this earth; there is only opportunity." Some opportunities you take, others you give. Here's your Excuse Book, America. There's something for almost everyone. Luckily, there is still an infinite abundance of excuses, guilt-tripping, victimhood, rage against those with "more" (never mind what they sacrificed to build it) and denial of choice, consequence, risk and fact. Yes, there are injustices and imbalances of power and wealth that we collectively need to remedy. But the way to do that is to embrace fact, responsibility, choice, consequence and thrift rather than deny those realities in favor of a false dichotomy of victim and heartless non-victim. If those are the only "choices" left, America, count me out. Thank you, Gregory D. ($5), for your most generous contribution to this site-- I am greatly honored by your support and readership.